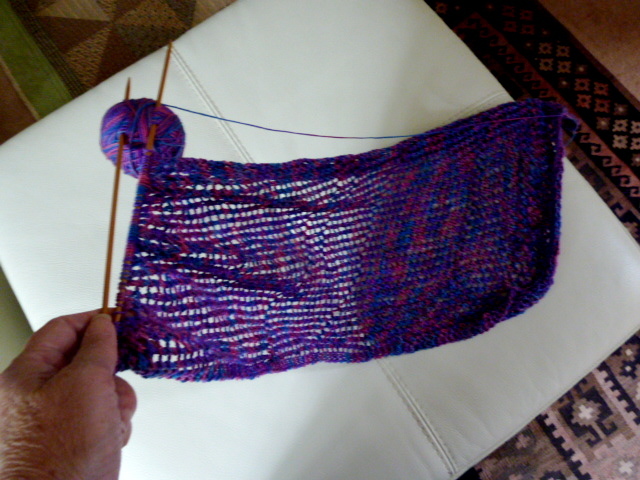 I got the knitting bug over the break and I really wanted to knit a fine yarn lacy shawl. I’m a reasonably accomplished knitter but I have to say I had problems with the patterns I found. Some of them had instructions which were incorrect but which I didn’t find out until several hours into the shawl! I tried four different patterns and ended up undoing them all. One was my fault, somehow or other I kept making a mistake and having to undo it. What to do? Make my own pattern! I decided to make a lacy scarf first and so I made up my pattern and got stuck in. Here is my progress so far. What do you think? The yarn is a fine Merino sock yarn (4 ply) hand-dyed here in Sydney. 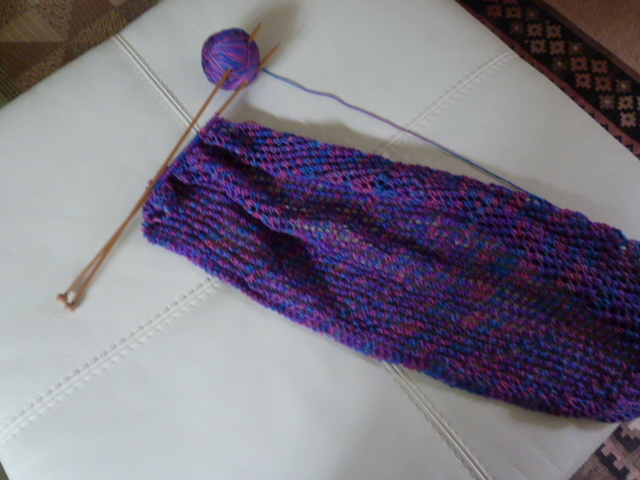 It feels lovely but isn’t very well plied and starts to unwind and split. I’d still like to knit a lacy shawl so if you know a good pattern please let me know. I’m at work right now, but I’ll look when I get home. I think I saved some lacy shawl patterns. Of course, I’m too cowardly to jump into any of them yet…lol. I wondered what you were up to. I hadn’t heard from you in a while. Yours looks lovely so far. Check out Ravelry. Plenty of patterns & reviews. I personally wouldn’t knit any open work pattern that wasn’t charted. If I really love a text pattern, I always chart if first. Text is just too prone to errors. It was Ravelry patterns I had a problem with. I also don’t like charted patterns I find it too easy to lose my place. I much prefer text. However having said that, despite searching for free lacy shawl patterns some of the ones in your list I haven’t seen before. Thanks for taking the time to help. Here’s a link to 88 free lace scarf patterns on Ravelry. Oops! That’s 88 Pages (about a dozen a page)! AH HA, the problem isn’t the knitter its the pattern. I’m so glad to hear that. It must be the season because I am also struggling with a knit pattern. Naturally Caron has a web site, I love the bamboo rayon yarn but can not get the lacy scarf more than a few rows and problems. Ready to pull my hair out. Perservere? I used to design knitting and was paranoid about getting the instructions right, so I would write down every stitch (!!!!!!!!!!!!!!!!!!!!) as I was inventing it. Then wrote out a ‘proper’ pattern from that, then re-knit the garment from the second pattern and if it went wrong I denied myself chocolate! All knitting patterns had designers who worked in a very careful way, but it seems it’s like editing books these days. It just isn’t done carefully any more. I read patterns through a couple of times before I start on something. It’s simply that I just do not trust the patterns. Good luck, the colour of the merino is gorgeous.